We're delighted to welcome fine artists in 'ART UNLIMITED 100 Contemporary Artists', the Masters of Today new museum quality art book for galleries, museums and art fairs, to connect private and corporate collectors around the world, a unique opportunity to include an artist profile at the huge discount as 75%. - The completed Application Form (click-on PDF Application Form). 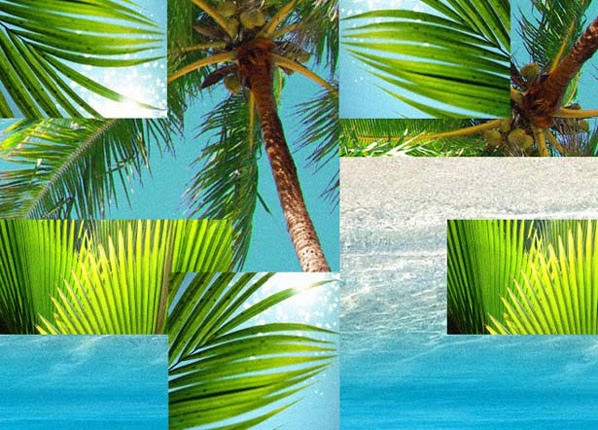 - 3 ~ 6 art works (email us 300 dpi/ 23 cm/ 9 inches JPG /TIFFs image files). - A picture of yourself (300 dpi/ 5 cm/ 2 inches JPG /TIFFs image file). - one-page: 590 Euro /US$ 810 USD. That is 75% off. - two-page spreads: 990 Euro / US$1359 USD. That is 75% off. 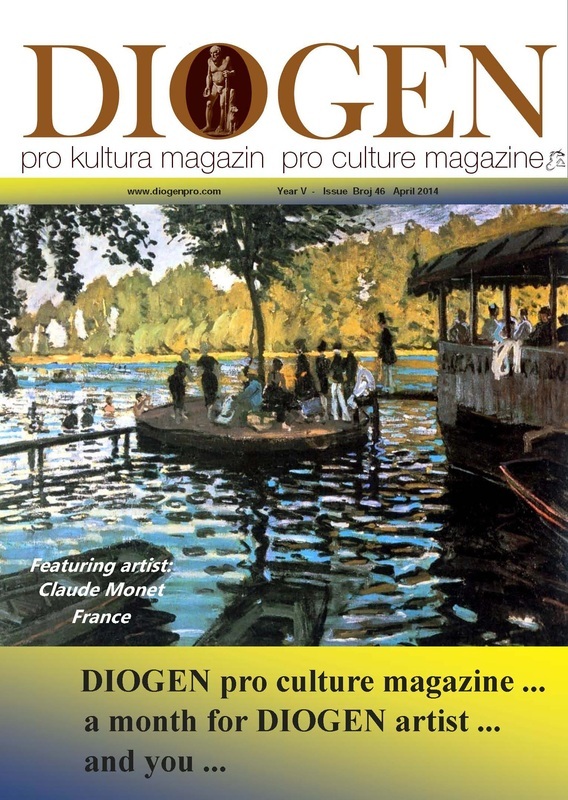 The advertising fee should be provided by a gallery, corporation or individual contributor or self-provided after notification of acceptance and after receiving a layout alternative in the book. The distribution is through large book wholesalers and ecommerce channels in US bookstores and internationally including Barnes & Noble, Amazon ad more. The editors will review all submissions and make decisions on acceptance. If you can't complete the PDF Application Form you can submit the files and information requested above. For consideration you may apply as soon as possible. Limited edition art book of 25,000 copies, distribution worldwide through book stores and ecommerce including Amazon. We're also offering the book as a mobi, ePub and PDF to stream directly to our 200,000 subscribers, galleries, museums and art collectors computers and tablets. Size 23 x 23 cm | 8.5 x 8.5 inches, hardcover, museum quality offset printed on art paper. Each included artist in the volume will receive three copies at the shipping and handling charges based on the delivery option you choose. Winners will be asked to FTP, overnight or express post high resolution files to the gallery for printing. Headlands Center for the Arts announces the launch of the Chiaro Award, a fully sponsored artist residency and cash prize for an accomplished mid-career painter residing in the United States. This major award is designed to have meaningful impact on the life and career of one artist per year, by both recognizing past success and by fostering his or her ability to continue to produce exceptional and exemplary work in the medium of painting. Residencies of six to ten weeks include dedicated use of a private studio, chef-prepared meals, comfortable housing, and a cash award of 15,000 USD. The Chiaro awardee will become part of the dynamic community of artists participating in Headlands' programs, sharing in peer-to-peer creative exchange while developing his or her individual artistic practice. Application and program details at https://www.headlands.org/chiaro-award. Headlands Center for the Arts is a multidisciplinary, international arts center located just north of the Golden Gate Bridge in the Marin Headlands, a part of the Golden Gate National Parks. Artists programs at Headlands are designed to support artists, the creative process, and the development of new, important work. These programs provide opportunities for research, experimentation, professional development, and peer-to-peer exchange—and ultimately aim to foster creative breakthroughs and new modes of working and thinking. All told, more than 70 artists participate in our programs each year. By bringing together local, national, and international artists from a wide range of disciplines—including visual and interdisciplinary artists, architects, dancers, choreographers, musicians, composers, writers, and curators—our programs enable the exchange of ideas and approaches that help catalyze new cultural and social perspectives. The theme is Still Life. All subject matter and photographic processes are welcome. Dr. Rebecca Senf is the Norton Family Curator of Photography, a joint appointment at the Center for Creative Photography and the Phoenix Art Museum. Senf earned a Ph.D. in Art History at Boston University. In Boston she worked on the Museum of Fine Arts, Boston’s major exhibition Ansel Adams from The Lane Collection, for which she also co-authored the exhibition catalogue. In October of 2012 her book Reconstructing the View: The Grand Canyon Photographs of Mark Klett and Byron Wolfe was released by University of California Press. Upcoming projects include exhibitions on the photographic book and platinum photography. With selection for this exhibition, the artists are invited to join C4FAP on the reception weekend for review with the juror Rebecca Senf and Director Hamidah Glasgow. There will also be a group portfolio share and an artists’ lunch at C4FAP. An international audience of collectors, curators, art consultants and other advocates of fine art photography will view the chosen artist’s work throughout the exhibition. Each participant is included in the Center’s Main Gallery exhibition in Fort Collins, Colorado and Online Gallery exhibition. In order to be included in the online gallery or to receive an award, you must provide a professionally printed and framed/mounted image for gallery exhibition. All chosen artists will be included in the exhibition catalog. Honorable Mention Awards: 2-year membership and image submission to a call for entry at the Center. Eligibility: The exhibition is open to all photographers world wide, both amateur and professional. The Center invites photographers working in all mediums, styles and schools of thought to participate in its exhibitions. Note: Images selected by jurors for exhibition at the Center in the previous 12 months are NOT eligible. Images previously submitted but not yet selected for exhibition may be resubmitted. 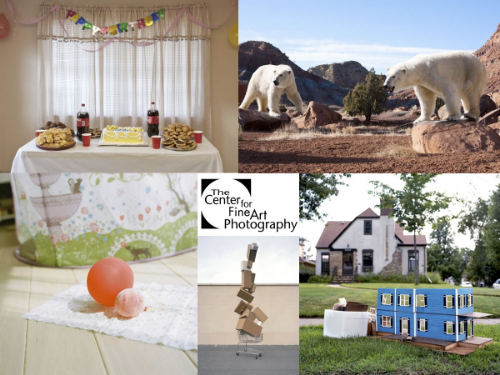 Founded in 2004 by photographers, The Center for Fine Art Photography is a nonprofit photography organization. We provide support to photographic artists through exhibition, solo exhibition, promotion, education and connection to a large community of other artists, curators, gallery owners and photographic professionals. Public Welcome. Founded in 2004 by photographers, The Center for Fine Art Photography is a nonprofit photography organization. We provide support to photographic artists through exhibition, solo exhibition, promotion, education and connection to a large community of other artists, curators, gallery owners and photographic professionals. Open Tues-Sat, Free, Public Welcome. Knotwe is an emerging online hub for learning, resources, ideas, and reviews for the novice to the experienced fiber art enthusiasts. Knotwe is a platform for traditional practices and technological and material innovations in the fiber arts, textile & surface design & craft community. Knotwe members can network and share ideas or questions through the Knotwe Forum. The Knotwe Magazine is a curated selection of articles and information published quarterly both as a digital magazine and as a print-on-demand material. Whether it is felted, knitted, raw, synthetic, new textile applications, old applications, ecological issues, economic issues, 3D technology applications, innovative textile/ surface design, technical insights.. Knotwe is reviewing articles for possible inclusion into our inaugural quarterly magazine and web coverage. -Knotwe welcomes submissions from accomplished to emerging writers/artists. -The applicant as needed in time for the publishing deadline must correct any errors, additional materials or image size issues at Knotwe's request. -All applicants must have an active email account information provided at time of submission of application materials, in case if selected the editorial team needs to reach the applicant for approval notification or editing issues. If applicant does not respond in a timely manner, the submitted material will not be included at time of publishing the first issue. -All written content submitted must be in Standard English language. -All written content and images submitted must be the applicant's own original works. Outside sources must be properly cited and given credit to prior to publishing deadline. Applicant is responsible for citations and credits in the contents of the applicants submission materials. -Accepted applicants receive a digital download of the magazine and one printed copy of the magazine. -Accepted applicants will also be featured on the Knotwe website and listed under the Contributors section. - All accepted applicants become part of the pool of potential special guest contributors for future Knotwe web or magazine content. - Knotwe will begin assessing submissions as they are received. Approved applicants will receive notification via email after the deadline has passed and we are able to assess all submitted materials. -Minimum 500 to maximum 1,200 word count. -There is a $25 submission fee per article submitted. Email PayPal Confirmation Number with submission materials. Submissions are reviewed for possible inclusion into the quarterly Knotwe Magazine and/or the Knotwe website. Accepted works will be published as a digital magazine as well as limited on-demand-printing available for download or purchase through Knotwe or Knotwe authorized vendors. Accepted applicants will receive a copy of the magazine and promotional materials in additional to general promotion of the magazine issue release. For questions and/or difficulties email knotwestudio@gmail.com. 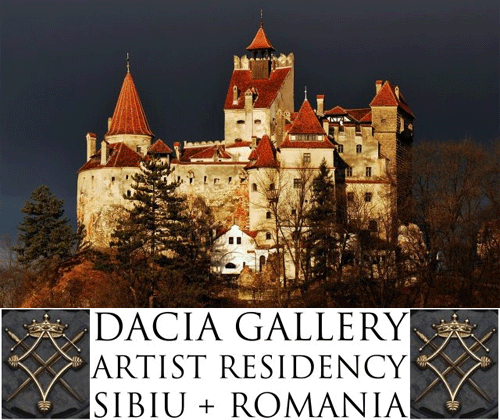 Dacia Gallery invites artists to participate in an exciting summer Artist Residency Program in picturesque, Sibiu, Romania. Dacia's Artist Residency provides an academic program to inspire, refine and redefine the creative direction of artists in a painting intensive four-week and two-week program. Enjoy weekend painting and sketching trips to the mountains, castles, art museums and medieval Byzantine monasteries to study ancient frescos and icons. And what's a trip to Romania without a visit to the medieval castle of Vlad the Impaler, otherwise known as Dracula. This is a wonderful opportunity to travel, study and paint abroad. CAPACETE will launch a new one-year program in the city of Rio de Janeiro, Brazil, for up to 12 international participants dedicated to research and practice in the arts and critical thought. It will start its first edition in March 2015. Thought is action. Our globalized contexts are structured by an unequal social distribution of labour and wealth, increasingly moulded by speculative market-based economics. Many of today's cultural manifestations are large-scale events that are too often either directed at a generic public or a restricted elite. This reduces and neutralizes the concrete ethical and political reach of art, as well as its potential for fostering discussion and inspiring other ways of working, thinking, relating, and living. Our intention is to build situations and develop strategies that provide a concrete and actual alternative to this state of affairs. Our program is designed to reflect the cross-disciplinary character of contemporary aesthetic practices, by working with artists and thinkers whose endeavors articulate the theoretical world with artistic presentations in several formats and dynamics and for different audiences. By challenging the actual state of culture, economy and education, our primary function will embrace self-organized, artist-run, participatory and collaborative modes of action as a fundamental part of the content and structure of its activities. Application form and detailed information on the program can be found athttp://www.capacete.net. 12 participants will be selected for the program. Our aim is to reserve four positions for Brazilians, four for South Americans, and four for the rest of the world. The duration of the program is ten months, from the 1st of March to the 20th of December, with a one-month break in July. The program is designed as a fluid and adaptive platform of exchange between the participants and the lecturers and advisors. The program will offer nine seminars given by nine lecturers from different backgrounds. Seminars will extend from three days to up to five days duration. Each lecturer will also do a public talk open to the main public. In addition, different talks, presentations and events will be organized throughout the year with other guest lecturers. One of the ambitions of our program is to have each yearly program culminate in a collective project, designed by the participants, one that can take on any number of forms (presentation, performance, publication, exhibition, seminar etc.). However, in keeping with the participative logic of our project, rather than frame this as a requirement, we prefer to conceive of it as a potential whose actualization will be decided by the participants themselves. Participants are also encouraged to develop individual projects. Use of the facilities of CAPACETE resort office and exhibition space and other infrastructure will be made available for such projects, and contact with local institutions and agents will also be facilitated. The program will organize trips to different sites of interests in accordance with the selected group of participants (walks, seminars in different sites); and for this, will collaborate with similar organizations in Brazil and South America. Studio visits with local and visiting professionals, as well as visits to the studios of local artists will also be organized. It is important to note that CAPACETE is not a studio-based program. Work facilities are available and can be organized on a case-by-case basis, but designated workspaces are not automatically provided for each participant. Andrea Fraser, Suely Rolnik, Amilcar Packer, Helmut Batista, Carla Zaccagnini, Daniela Castro, Pedro de Niemeyer Cesarino, Ricardo Basbaum, Bik van der Pol, Cristoph Keller and Jorge Menna Barreto. For the complete program of the seminars and biographies please check our website: www.capacete.net. Main advisers: Amilcar Packer, Manuela Moscoso and Helmut Batista will follow and contribute with the participants during the whole program by the means of several meeting over the year. These advisers will also offer seminars and talks in the yearly program. Guest lecturers: CAPACETE will also invite artists, theoreticians, curators and other collaborators from different backgrounds to propose courses, seminars, or other forms of exchange with the participants along the year. CAPACETE will keep an open dialogue with the participants, considering their interest and goals, even with respect to inviting relevant guests. To help participants finance their stay in Rio de Janeiro during the program CAPACETE will agency working possibilities with artists such as Antônio Dias, Luiz Zerbini, Ernesto Neto, Laura Lima, Tiago Carneiro da Cunha, Daniel Steegmann, Chelpa Ferro, Rosangela Rennó, Marcos Chaves, Arto Lindsay, etc. These scholarships are part of the promotion programme for artists of the Braunschweig University of Art and the State of Lower Saxony. This programme is aimed at young artists who are interested in working intensively on artistic projects in the close environment of an art university. For more information and the application, please visit our website. The application deadline is May 30 (date of receipt by mail). The Braunschweig University of Art is an internationally oriented art university with the right to grant doctorates and the right of habilitation. With 1,200 students in Fine Arts, Design, as well as Aesthetics & Art History and Media Studies, the Braunschweig University of Art is one of the largest art academies in Europe. Excellently equipped studios and laboratories provide the ideal working conditions for all intellectual, creative, and artistic processes. FINAL CALL FOR ENTRIES to the Renaissance Photography Prize 2014, an international photography award celebrating emerging and established talent and raising money to support younger women with breast cancer. It is a great opportunity for photographers worldwide, but the deadline is fast approaching - Monday 28th April is the last day to submit. 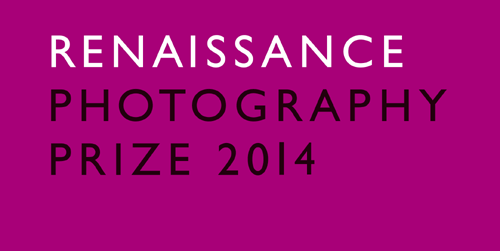 Enter Renaissance Photography Prize now to get your work seen by some of the most highly regarded photography critics, and the chance to win £6,000 (approx. $10,000) worth of prizes in total, including cash, professional printing, portfolio reviews and valuable international exposure. 60 finalist and shortlisted photographs will be selected by the judges to be exhibited at Getty Images Gallery in London, UK this September and the winners will be announced at the 2014 award ceremony. Photographers can enter single images and/or series of work. The competition is open to everyone. And the good news is it's all for a good cause. All profit from your entry fee is donated to Lavender Trust at Breast Cancer Care. All entrants receive a 20% discount on digital C type printing from Metro Imaging, valid until the competition deadline. Joanna Szupinska-Myers, Curator of Exhibitions at the California Museum of Photography. Enter our juried competition featuring digital art and photography. Entrants submit three JPEG files of original work. All styles of artwork and photography where digital processes of any kind were integral to the creation of the images are acceptable. Video stills are acceptable. Forty selected winners receive one print up to 24x36 on museum quality paper to be shown in an international group exhibition in our gallery. The show will be widely promoted and will include a reception for the artists. Multiple entries are permitted, separate entry fee required for each set of three images submitted. Exhibit Dates: June 12-July 5, 2014. Now in its 27th year, The Sunday Times Watercolour Competition is the largest and most prestigious prize for contemporary watercolour painting in the UK. Generously sponsored by Smith & Williamson, the competition aims to celebrate and reward excellence and originality in the medium of watercolour. The Sunday Times Watercolour Competition provides an opportunity for artists across the UK to redefine and celebrate watercolour and water-based media. It offers a generous total prize fund of £18,000, including a First Prize of £10,000, Second Prize of £6,000, Smith & Williamson Cityscape Prize of £1,500. Approximately one hundred works, which reflect the true breadth of the medium, will be selected by a panel of leading figures from the art world, including: Sarah Armstrong Jones, artist; Desmond Shawe-Taylor CVO, Surveyor of the Queen’s Pictures; and Louis Wise, Critic and Writer, The Sunday Times. The works will be shown at the Mall Galleries, London from 15 – 20 September 2014, followed by the Smith & Williamson tour to venues across the UK. 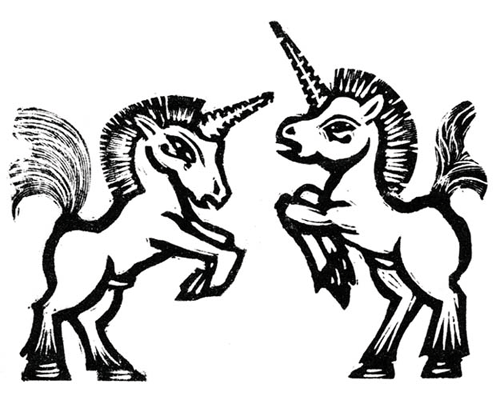 Artists are invited to submit up to four works for online entry by 5pm, 2 June 2014. Entry is £15 per work. Full details can be viewed online at www.parkerharris.co.uk. 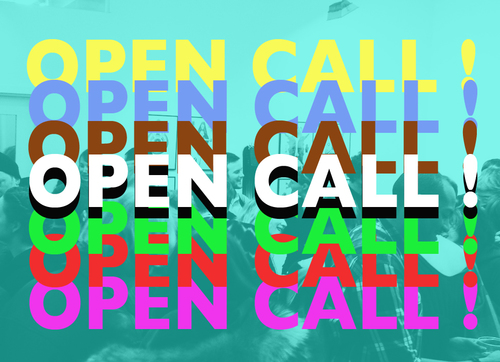 The NARS Foundation is pleased to announce its third annual Juried Solo Exhibition Open Call. The NARS Juried Solo Exhibition Program provides emerging and underrepresented national and international artists with the opportunity to present a solo exhibition in New York City. The aim of the program is to create a platform for artists to experiment and exchange ideas while exposing their body of work to a wider audience. The Juror for this year's Open Call is Eric Shiner, the Director of The Andy Warhol Museum in Pittsburgh, PA. The NARS Juried Solo Exhibition Program strives to present the most innovative and compelling artwork being produced today. The program provides one selected artist with gallery space and curatorial and administrative support for a solo show. The artist must present a strong cohesive body of work produced within the last five years. 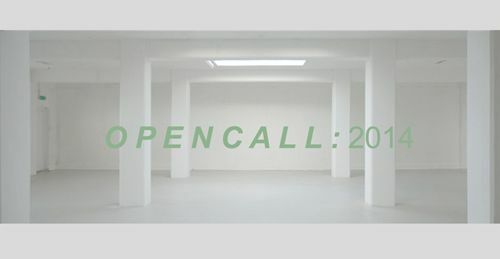 Field Projects is pleased to announce our 2014 Summer Open Call! Field Projects hosts two open call exhibitions per year. Emerging and mid-career artists are invited to submit their work for consideration in our July exhibition, Show #21 curated by artist and Storefront Ten Eyck gallerist-extraordinaire, Deborah Brown. All of the submissions we receive will be considered not only for Show #21, but also for future exhibitions at Field Projects and our Top Ten online exhibition. Field Projects is an NYC-based project space located in the heart of Chelsea's gallery district. As an artist run space, we are committed to opening the field of exhibition opportunities to other working artists. Whether you have submitted to Field Projects before or it's your first time, we would love to see your work! Check out our last Open Call exhibition Show #17 winners and Top Ten runners up! Deborah Brown is an artist, curator and gallerist. Since 1982 she has lived and worked in New York where her work is represented by Lesley Heller Workspace. In addition to her practice as an artist, she owns and directs the gallery Storefront Ten Eyck in Brooklyn, and serves on the board of NURTUREart, the artist advisory board of BRIC, and Community Board #4 in Bushwick. She received a B.A. in Art from Yale, and an M.F.A. from Indiana University. Her public art projects include mosaics commissioned by the MTA for the Houston Street subway station in Manhattan and roundels for the Royal Caribbean Cruise Terminal at the Port of Miami for Miami-Dade Art in Public Places. Artists working in all mediums are welcome to apply. All artwork submitted must be ready to hang or install, completed work. Artists living outside NYC are also welcome to apply, however you will be responsible for artwork shipping costs. Artists working in new media, film, or video- you may be required to use your own equipment for exhibitions. Artists may submit up to 5 works. Friday, May 23rd, 2014, 11:59 PM !! Selected artists will be notified the second week of June. All artwork must arrive at Field Projects by Saturday, June 28th Show #21 opens on Thursday, July 3rd and will run through Saturday, August 2nd All artwork will be for sale at the gallery during the exhibition. 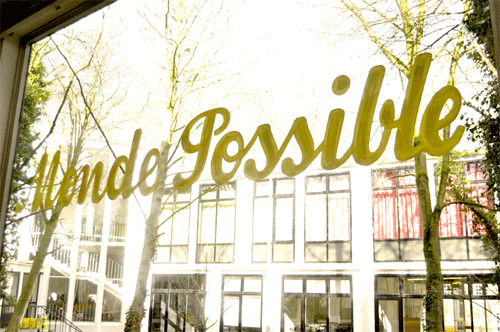 VITRINE invites applications for a summer residency in Bermondsey, London. The residency offers four artists – with cross-disciplinary practices – the space, support and opportunity to make work towards a summer exhibition at the gallery. The residency is open to London-based, national and international artists. We welcome applications from artists working across all media. Artists working site-specifically and/or with public space, and those working with performance, sound, installation, photography and video, are encouraged to apply. 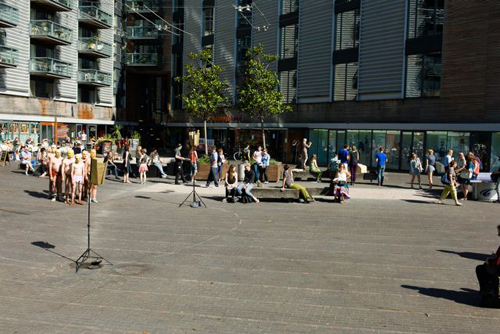 VITRINE Bermondsey Square being a great location for artists to explore and experiment with performance in a public realm. Buses: 42, 78, 100, 188, 1 and C10 (direct to bermondsey square) or all buses to London Bridge. The Florence Trust is so much more than just an artists' studio. The Florence Trust offers twelve-month studio residencies commencing in August each year for up to a dozen carefully selected artists. 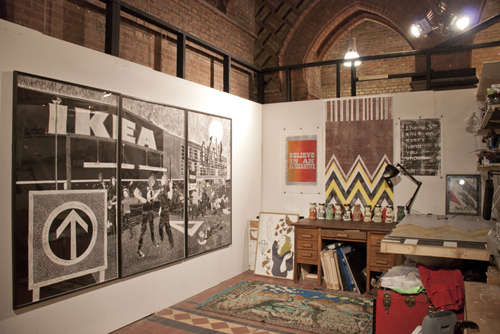 During the residency, each artist gets 24-hour access to a studio within the Trust's Grade-1 listed neo-gothic church. The artists are then all included in the Trust's two annual exhibitions in January and July, with a full-colour catalogue that profiles each practice and includes a text by an independent arts writer accompanying the latter exhibition. Throughout the year, the Florence Trust provides a mentoring programme tailored to the requirements and objectives of each resident. This includes one-to-one sessions with the Director; resident curator; members of the board of Trustees; as well as visiting artists, writers, and curators. Alongside this, the Trust helps its residents build a valuable network of contacts. The artist's relationship with other residents will form a significant part of this network and this will be strengthened through peer-critiques, workshops, and exhibition projects. This is then supplemented by connections created through meetings with gallerists during gallery tours and outside curators during studio visits. Asia Art Archive (AAA) announces the 2014 call for proposals for The Robert H. N. Ho Family Foundation Greater China Curatorial Residency Programme. With support from the The Robert H. N. Ho Family Foundation, the grant offers a one-year fellowship to support curators interested in developing historical or research-oriented art exhibitions relating to contemporary art in China. The grantee will be awarded a total of 15,000 USD and is expected to spend up to two months conducting research at AAA. Together with a panel of judges that includes professional curators and scholars in the field, AAA will assess and select applicants based on their knowledge of contemporary Chinese art, relevant experience in the field, proposed methodology, and the substance of the proposed research, as well as its practicability and feasibility. Applicants are welcome to propose their own topics, but encouraged to draw on AAA's extensive collection of primary documents from Mainland China, Taiwan, Hong Kong, and Macao. Applicants can develop proposals for exhibitions that explore specific periods of time, themes, or phenomenon in Chinese art from an art historical perspective. Proposals may also be part of a larger curatorial project which frames China and Chinese art within a broader context. Both institutional and independent curators and scholars are eligible to apply. Those who have experience in research and curatorial practice related to contemporary Chinese art are preferred. The selected project is expected to begin in July 2014 and be completed by July 2015. The grantee will be required to submit interim reports updating AAA on his/her progress throughout the project. 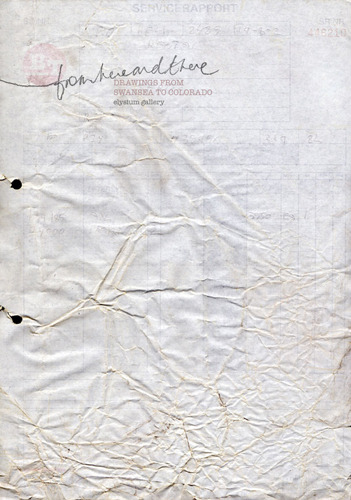 Upon the project's completion, the grantee must submit to AAA a copy of all documents and original materials collected during the course of the project, along with a final report that consists of an essay and an exhibition proposal (with components such as exhibition designs, a list of works, collateral programmes, etc.). AAA would encourage applicants to consider an online component of the final proposal in addition to the written materials. The project will conclude with two public presentations by the grantee (one in Hong Kong and another in either Mainland China or Taiwan). Although further collaboration and support is possible, the grant will not help the grantee to realise the exhibition in the proposal. Applicants are required to provide tentative timelines for exhibitions with their proposals. AAA will award 15,000 USD (approx. 120,000 HKD) to the successful candidate. Budgets should allow for a two-month residency in Hong Kong, research trips to Mainland China, Taiwan, and Macau during the AAA residency, and the acquisition of new materials. Autocenter Summer Academy - ACSA 2014 will take place in the renowned Berlin exhibition space Autocenter, in the very heart of Berlin. Autocenter is characterized by its autonomy, openness and its workshop attitude - a crucial premise for setting up new formats of artistic exchange that is invaluable for young artists. This year’s ACSA program will offer participants a rich combination of practical and theoretical knowledge in a wonderful atmosphere and setting. This program fosters personal encounters and discussions with a wide selection of international experts drawn from all fields of the arts. In addition, the ACSA will provide manifold insights into the art world, its institutions and its discourses. For ACSA 2014, an exciting four-week program has been drawn up. Participants can choose how long they wish to attend, selecting from one of two weekly classes. Each intensive course is designed and lead by major international artists. In each week-long course, 15 participants will have the opportunity to develop their artistic practice and theory whilst interacting with their teacher - at the same time immersing themselves in one of the most exciting city art scenes in the world. In addition to the classes, each week’s schedule includes three lectures and an art tour in the company of experts, journalists, collectors and curators. The guided tours will enable visits to studios, galleries and art institutions and to the various other stunning sites Berlin has to offer. At the end of every week, on Saturday evening a public presentation will be held in Autocenter. We are excited to announce that for the first time we will offer a two-week theory class (second and third week) this year. This course will be run by critic and author Jennifer Allen and architect and critic Thibaut de Ruyter. Together with up to 12 participants this course will delve into theory, history and the actual process of exhibition making. The Tate St Ives Artists Programme is now open for submissions. Continuing the legacy of the artists’ colony in St Ives, we are offering a number of residencies for artists and creative practitioners from between five days and six months. The Artists Programme will provide an opportunity to engage with Tate St Ives, our communities, as well as our learning and public programmes. We support the development of diverse artistic practices, providing a productive environment that values experimentation and risk, discussion and debate. The deadline for applications is Midday Monday 28 April. The Artraker Annual Award is for contemporary artists / organisations that make a direct positive change in countries that have experienced social upheaval and violent conflict. Artraker is interested in the significance of the artists’ contribution to change and the co-creation of experiences of freedom in the midst of conflict. Artraker will offer three Award Funds of £2,500 (per Award) for completed work or work that can be further developed. The award winners and 9 shortlisted artists/organisations will be invited to join the Artraker network (“the Artrakers”). The Artrakers’ works will be shown at exhibitions in London and Paris. The award winners will be announced in the run up to International Peace Day, 21 September 2014. Submissions will be considered in relation to three award categories. Submissions that display a range of qualities; originality, impact, exceptionality and engagement, within their explored conflict subject area. Submissions that create change in a conflict- or violence-affected area; that engender hope, change and peace, healing, remembrance, or diffuse situations of violence; or submissions from artists/organisations from war-affected countries, whose work, over time generate deep and long-lasting positive change. Submissions that reveal a different understanding or perspective on conflict, violence, and peace, submissions that use experimental methodologies (such as subversion, satire or intervention) to affect perceptions or understanding. The winner of the Innovation category will have his/her/their work included in the a/political collection. Entries are judged by an international panel of experts from disciplines of arts, conflict, culture, politics and peace. They look for experimentation and engagement, audacity, change and capacity to inspire. The Artraker Annual Award Jury for 2014 includes: Dr. Bernadette Buckley, Lecturer in Art & Politics at Goldsmiths College, University (United Kingdom); Rohan Jayasekera, investigative journalism & creative advocacy in conflict zones, former deputy CEO of Index on Censorship and Managing Editor of the Institute for War & Peace Reporting; Nikki Diana Marquardt, curator / gallerist at Galerie Nikki Diana Marquardt (Paris) & founder of Work in Progress; Fatima Kyari Mohammed, Executive Director and Managing Partner of West Africa Conflict and Security Consulting (Nigeria); Elvira Santamaria Torres, Mexican performance artist based in Ireland, Artraker Annual Award 2013 award nominee and an Artraker mentor. Artraker welcomes submissions from artists of all nationalities and at any stage of their careers. Please find the application guidelines here and apply here. An administration fee of £10.00 will be charged for submissions from OECD countries. Submissions from all other countries are free. Artraker is grateful to its partners who share its vision to promote and support conflict arts practice. Every year Manifest calls for little works of art from around the world. Each iteration of the project brings in hundreds of powerful yet diminutive works for our jury to consider. Inevitably this results in a gallery full of diverse, compelling, and exquisite little gems. Manifest’s patrons eagerly await the Magnitude SEVEN event each year. This annual project is one of the most light-hearted, fun, and varied exhibits in our season. So we are always excited to offer this call to artists to submit works no larger than seven inches in any dimension (any proportion). Standard presentation devices like mats and frames that are not considered part of the work of art are not limited by the 7" criteria. Magnitude SEVEN is open to everyone. The only limitation is that entries must represent original works of art that are 7" or smaller. This exhibit has no predefined expectation for type or style of work to be considered or selected. It is open to any and all traditional and non-traditional visual arts media (including 2D, 3D, video, etc. ), genre, subject matter, and content. The only limiting factor is size. There is no other thematic guideline. Artworld is delighted to announce its very first Open International Art Competition. The cash prize is €1,000: approximately $1,375 or £825. The winning artist will design, print and distribute a limited edition of 50 original hand-made prints. If you have any questions, email artworld@negativeentropy.net . Entries are invited for this important annual platform for emerging and established contemporary visual artists from across the UK and beyond. The Van Eyck invites visual artists with a strong interest in archaeology as a method for their own artistic practice to apply for a fellowship for a period of 6 months in the framework of "NEARCH - New scenarios for a community-involved archaeology". We are proud to say that the Van Eyck is a partner of NEARCH, a prestigious European project-based network of archaeological institutes and university departments. NEARCH is funded by the EU through 2018. We are convinced that with all differences visual artists and archaeologists share many similar attitudes, modes of thought and outlooks - amongst them the importance of looking, researching, finding, creating, interpreting, presenting. THE MATERIALITY OF THE INVISIBLE is one of the themes the partners of NEARCH aim to explore. This theme offers a hitherto unknown opportunity to research in practice the interaction between artists and archaeologists, to work together in close confines, to profoundly exchange information and to thoroughly questioning both professions in an age of change and fluctuating cultural attitudes. In 2017 an exhibition and symposium is planned to unveil the outcome of this process to an international audience of professionals and non-professionals alike. The starting point for this fellowship is the idea that all that is visible expresses what is invisible - be it a photograph, a house, a fragment, a day in my life, an artwork, a car in the street. And, similarly, all that is material stresses its immateriality - be it a ruin, a beam of light, a polished surface, a movie, a church. This is the tension of THE MATERIALITY OF THE INVISIBLE and of the working processes of artists and archaeologists. All potential applicants must apply before 1 May 2014. The NEARCH programme brings together the following research organizations, universities and European cultural institutions : Aristotle University of Thessaloniki (Greece ) Heritage Institute of Science - National Research Council (Spain ), Institute of artistic, cultural and natural heritage of the Emilia -Romagna region (Italy); Culture Lab (Belgium ) Faculty Archaeology at the University of Leiden (Netherlands ) Adam Mickiewicz University in Pozna? (Poland ), Archaeology Data Service , University of York ( UK ) German Archaeological Institute (Germany ), Jan van Eyck Academie (Netherlands ) CENTQUATRE - Paris ( France ), University of Oxford ( UK ), University of Gothenburg (Sweden). - Associated Partners : Archaeology Unit of the city of Saint- Denis , EAA - European Association of Archaeologists , ICAHM - International Scientific Committee on Archaeological Heritage Management. The Campaign for Drawing, in collaboration with the Guild of St George, is launching the second year of a new art award, The John Ruskin Prize. The second John Ruskin prize is open to all amateur and professional artists 18 years and over, living and working in the UK. Recording Britain Now invites artists to present fresh, contemporary visions of their urban, rural or social environment. Drawings, paintings, watercolours, prints, textiles, digital art and mixed media are welcome. Photographs, sculpture, sound installations and film are not eligible. This is a unique opportunity to join the ranks of earlier well-known commentators on the state of the nation! First Prize: £1000 and an opportunity to exhibit in the Millennium Gallery Sheffield during the major exhibition originated by the V&A, Recording Britain. Runners-up (15): Inclusion in Recording Britain NOW, the exhibition of short-listed John Ruskin Prize artists in the Millennium Gallery Sheffield, 28 June – 12 October 2014, partnering the major V&A exhibition, Recording Britain. This is a unique opportunity to join celebrated visual commentators on the state of the nation, and of nature under threat, from the original wartime recorders such as John Piper and Michael Rothenstein to more recent observers like Richard Long, David Nash, and Laura Oldfield Ford. 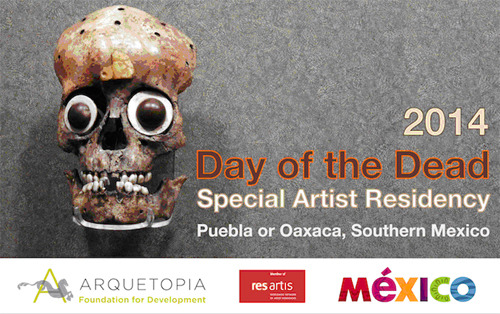 Founded in 2009 in Puebla, Arquetopia is an award-winning, Mexican official nonprofit foundation run entirely by artists. It has since grown to include the premier artist residency program in Mexico with extensive collaborative networks in Puebla and Oaxaca. Our resident artists have come from dozens of countries on six continents. We are proud that many of our artists have returned for residencies with us even two and three more times. Arquetopia’s Artist-in-Residence Programs offer important professional opportunities for emerging and mid-career, national and international contemporary artists, designers, curators, and art educators age 25 and over. Arquetopia is currently welcoming applications for the following artist residencies. Application deadline Sunday, April 20, 2014. Create and participate in southern Mexico’s spectacular Day of the Dead celebrations in the extraordinary multicultural kaleidoscopes of Puebla or Oaxaca. Varied art techniques eligible. This residency is offered at 6 weeks (extendable), September 29 to November 10, 2014. The NARS Foundation International Artist Residency Program provides national and international artists with the opportunity to produce new work while engaging with the vibrant arts community in New York City. Artists-in-residence have access to an individual studio space and various professional development programs. Residents have an opportunity to share and present their work through artist talks, workshops, and lectures and receive studio visits by prominent New York City curators, critics and gallerists. The NARS Foundation seeks applications on two levels. The first level includes emerging and mid-career artists for whom appointments as residents may make a significant impact on their careers. The second level consists of artists with established national and/or international reputations for whom a change of environment may offer refreshment and inspiration. Online application forms must be submitted by Tuesday, April 15, 2014 before midnight. Please note that there are separate applications for artists living in the US and artists living abroad. Please read the guidelines completely prior to beginning your application as our application. A non-refundable application fee of $35 (US) is required with each submission. CALLING ALL ARTISTS! 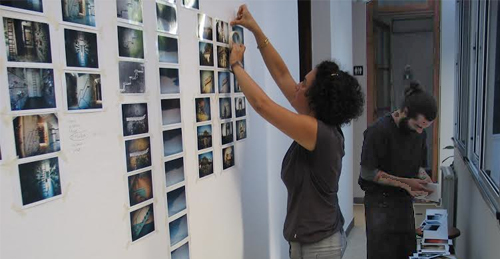 El Museo del Barrio’s Curatorial team is inviting artists of Puerto Rican, Latin@, Latin American, or Caribbean descent to register for a twenty-minute portfolio review. From April through early September 2014, OVER THE TABLE, a part of the Office Hours project, offers art practitioners in different stages of their development the opportunity to engage in one-on-one discussions about their work or an upcoming project. These informal exchanges seeks to turn the traditional artist-curator portfolio review into an act of camaraderie between individuals working in the same field. - Open to artists of Puerto Rican, Latin@, Latin American, or Caribbean descent living in the greater NYC metropolitan area. - Bring images of your work (in whatever format you choose) and the equipment that you will need to present it properly. Free Wi-Fi is available in El Museo’s Café. - You must be at El Café five minutes before the time allocated for your meeting and expect to be at El Museo for up to an hour. Late arrivals may not be seen. Currently, appointments are available on Thursdays from 3:00-4:00pm on April 23, May 22, June 26 or July 10, and will be held at El Café. Only one artist will be seen per time slot. 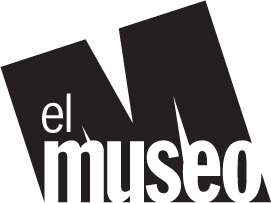 El Museo’s staff will contact you following registration to confirm the appointment. Playable City Award, Bristol, UKPushing the boundaries and encouraging experimentation, this international award sits at the intersections of art, technology and culture. Your proposed idea should be designed to be publicly installed in Bristol, UK in the first instance, whilst considering cross-cultural contexts and with the potential to be toured to other international cities. It will use technology in an integrated and interesting way. It will inject a sense of intrigue and meaning into public space. We are looking for artists, designers, architects, technologists and creative practitioners who can demonstrate a history of delivering high quality, innovative practice. Applicants can work in any field, but creative uses of technology must be integral to the proposal. We will consider completely new work, projects that have already been conceptualised but not yet brought to fruition and the development of existing areas of work but we will not support work that has already been fully realised. The work may be sited outdoor or indoor but it must be in a place with public access, be accessible for at least two months in Bristol, UK and be suitable for subsequent touring across the UK and beyond. The successful commission may come from anywhere in the world but it will be essential to spend some time in Watershed’s Pervasive Media Studio during the making process. Due to the collaborative nature of the award it is essential that the successful candidate can speak English with confidence. Autocenter Summer Academy — ACSA 2014 will be taking place in the renowned Berlin exhibition space Autocenter, in the very heart of Berlin. This year's program will offer participants a rich combination of practical and theoretical knowledge in a wonderful atmosphere and setting. Personal encounters and discussions with a wide selection of international experts drawn from all fields of the arts will be made possible. 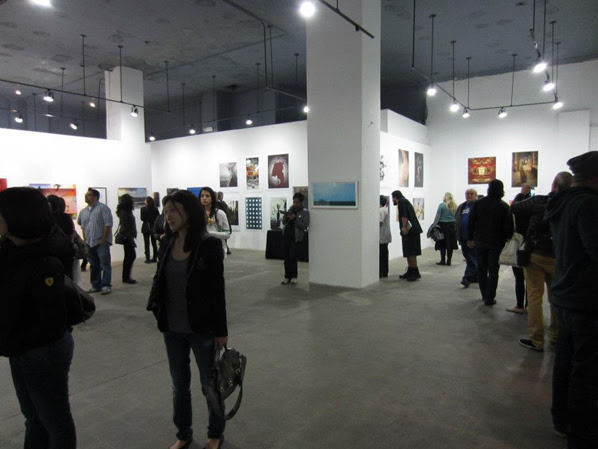 In addition, the ACSA will provide manifold insights into the art world, its institutions and its discourses. For ACSA 2014, an exciting four-week program has been drawn up. Participants can choose how long they wish to attend, choosing one of the two weekly classes. The two courses per week are taught by major international artists. In each week-long course, 15 participants will have the opportunity to develop their artistic practice and theory whilst interacting with their teacher—at the same time immersing themselves in one of the most exciting city art scenes in the world. In addition to the classes, each week's schedule includes three lectures and an art tour in the company of experts, journalists, collectors and curators. The guided tours will enable visits to studios, galleries and art institutions and to the various other stunning sites Berlin has on offer. At the end of every week, on Saturday evening a public presentation will be held in Autocenter. For the first time we will offer a two-week theory class (second and third week) this year. This course is set up by critic and author Jennifer Allen and architect and critic Thibaut de Ruyter. Together with up to 12 participants they will focus on theory, history and the actual process of exhibition making. Every artist knows the most important reason to enter a juried show is the ability to get your work in front of the people that need to see it. For this show, artists will feel like they have "won the Trifecta." Our 3 jurors for this exhibition are Lora Schlesinger, owner Lora Schlesinger Gallery, Santa Monica, CA; Norma Ibarra, Lead Private Art Consultant, Fresh Paint Art Advisors, Culver City, CA; and Betty Ann Brown, internationally recognized Art Critic and Curator. An artist's residency at the Royal Academy Schools, London. The Starr Fellowship is a residency at the Royal Academy Schools, the Royal Academy of Arts' contemporary fine art school. The fellowship is available to emerging American artists and the core of the programme is the development of the artist's own work in their studio. The Fellowship also offers opportunities to contribute to group critiques on our postgraduate programme. The Starr Fellowship runs from October 2014 to July 2015. The successful candidate is provided with a private studio located in the RA Schools and a stipend of 12,000 GBP. This is an opportunity for an artist with US citizen status to create work within the RA Schools for an academic year, culminating with a show at the RA Schools in July. The Starr Fellowship is made possible through the support of the Starr Foundation, which was established in 1955 by Cornelius Vander Starr, an insurance entrepreneur who founded C.V. Starr & Co. and other companies. Later these companies were merged by Starr's successor Maurice R. Greenberg into what became the American International Group Inc. Mr. Starr, a pioneer of globalisation, set up his first insurance venture in Shanghai in 1919. He died in 1968 at the age of 76, leaving his estate to the Starr Foundation. The RA Schools is an independent contemporary fine art school, proud to offer free tuition. Its three-year postgraduate course is designed to respond to the individual needs of each student and offers the opportunity to be part of a unique and intimate community of artists. As part of the Royal Academy of Arts, it is Britain's first fine art school, found just behind the Academy's Main Galleries on Piccadilly in central London. Its constantly evolving programme attracts some of the most sought-after teaching staff, visiting artists and thinkers in the world. The Botín Foundation, Spain's leading private foundation in terms of the scale of its investment, launches an international call for its yearly Visual Arts Grants, and for its summer workshop, to be directed this year by Cuban artist Carlos Garaicoa. The Visual Arts Grants provide artists with financial support for education, research and the undertaking of personal projects in the sphere of artistic work. To conclude the grant cycle, the Botín Foundation organizes a group exhibition featuring works by all the grantees, and accompanied by a catalogue. The call is open to individuals of any nationality; applicants must be over 23 and under 40. The deadline for submitting applications is April 30, at 2pm. All applications must be filled out online https://www.fundacionbotin.org. The other documents must be sent to the Botín Foundation in Santander. The workshop will be led by Cuban artist Carlos Garaicoa and will take place in Santander (North of Spain) from June 30 to July 11. The workshop will admit a maximum of 15 artists. Applicants from any nationality will be considered. Participants who do not reside in Cantabria will be provided with free shared accommodation and a stipend of 455 Euros, paid at the end of the workshop. Applications must be submitted online by April 30. 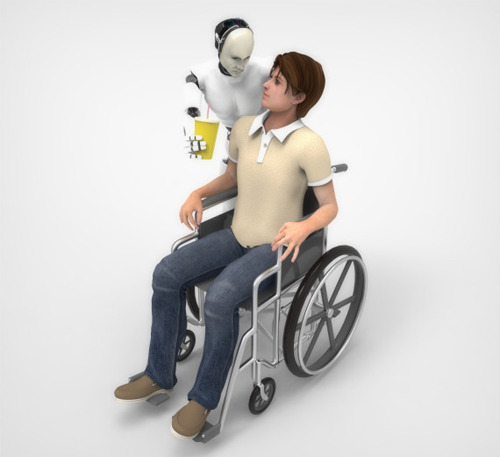 Terms and conditions at https://www.fundacionbotin.org. APPLY NOW! ACCEPTING APPLICATIONS FOR MAY 2014 AND DECEMBER 2014 ONWARDS! Surface Arts has created this residency opportunity, in Thailand, in partnership with Rumpueng Community Art Space to bring international artists, who focus on collaborative practices, together from around the world to share skills and ideas. Local and international artists work together to produce new work,exhibitions, provide public events and workshops. Our space is at the heart of the local art community of Chiang Mai and provides a creative hub for local artists. The residency program will invite international artists, working in any medium, into this environment to focus on mutual learning, process, participation and creative education. The residency concentrates on using collaborative practice to generate new work and new audiences and allows artists the time to develop their artistic practice and further their careers. The residencies will be for at least one month. We encourage applications from all artists, writers, musicians, curators, performers etc. and also from artist groups. Each residency will be tailored to the individual artists. 360 XOCHI QUETZAL is a FREE artist and writers residency located in Chapala, Mexico. The deadline for our new Summer Residency Progam is Saturday, April 5, 2014. International visual artists, writers, photographers and musicians can apply for 1, 2 or 3-month residencies. The 360 XOCHI QUETZAL Artist and Writer's Residency Program is located in Chapala, Jalisco, Mexico on the shores of the largest lake in the country where the perfect year-round climate and stunning lake and mountain views have long established the region as an international artist mecca. We now offer four live/work spaces. Residents will be inspired by the natural beauty, history and culture of this special part of central Mexico. Chapala is located 25 minutes from Guadalajara International Airport and 45 minutes from Guadalajara, one of the largest cities in Mexico boasting abundant cultural resources: museums, galleries, theatre and artist supplies. Xochi Quetzal is the Aztec goddess of creativity and fertility and protector of artisans. She is sure to inspire you during your stay! CRITERIA: National and international visual artists, photographers, writers, new media makers and musicians over the age of 25 are welcome to apply. We base our selections on artists who demonstrate artistic accomplishment, submit a well-conceived residency project, indicate that this residency will make a significant impact and provide evidence of the self-reliance required for a residency in the developing world. One of the live/work spaces is earmarked for a writer and one for an emerging artist. Two-person collaborative teams are also encouraged to apply. Jeannine is Adjunct Curator at the Museum of Arts and Design in New York City and is a paintings consultant at the Museum of the City of New York. She was previously Curator of American Decorative Arts and Sculpture at the Museum of Fine Arts, Boston. Jeannine has published and lectured widely on American art, especially decorative arts and contemporary craft, and teaches the history of American ceramics at the Rhode Island School of Design, Providence, Rhode Island. We provide large work tables and generous wall space for Studio Work Surface and Wall visual artists. All live/work spaces have desks and free wi-fi. We offer a spinet piano for musicians and professional easel for painters. Plein air painters and artists who draw have endless access to warm, outdoor beauty and can also work in the patio of our downstairs casita. Ceramic artists have access to our Kress kiln which can fire up to cone 6. All spaces also have private kitchens, living rooms, bedrooms and full bathrooms. FUN: All live/work spaces are walking distance to a park with a running track, pool, tennis courts and walking trails. We are also 5 minutes from the malecon, a park-like promenade that runs along the lake for Malecon-in-Chapalaa mile. The lake is surrounded by hundreds of mountains and you will enjoy spectacular sunsets almost every night. The weather is sunny 300 days a year with average daytime temperatures in the 70s. Other nearby activities include hiking, dancing and thermal springs. COMMUNITY: Chapala and nearby Ajijic have dozens of cafes and galleries, art openings, and hundreds of artists to connect or study with. Everything you need is within walking distance and our bus service is frequent and inexpensive. This is a safe place to live, work and the residency houses are secure. COSTS: This is a free one-month residency. Your residency offers you a private, fully equipped live/work space, free wi-fi, weekly maid service, a food stipend of $1,000 pesos plus all utilities. You will only need to pay for your laundry, local transportation, entertainment and additional food. International calls can be made via skype. You are responsible for your travel to and from Mexico. Depending on your arrival and departure times, our Program Administrator, Alberto Alvarado, may be able to pick you up at the airport. If not, it is easy to arrange an airport taxi which will cost $400 - 500 pesos each way depending on the time of day you travel. MISC: Although speaking a little Spanish will make your time here more culturally integrated, you do not need to speak the language to get what you need. Food is inexpensive in Mexico, typically costing about $20/week US. Eating out is quite affordable with meals costing $3 - 10 US. You are just a 5 minute walk from many stores and restaurants. HOUSE RULES: Your spouse/significant other is welcome to join you. Your children, guests and pets are not permitted (there are many bed and breakfast hotels nearby for visitors). Smoking and firearms are expressly prohibited. SPRING DEADLINE AND NOTIFICATION: The deadline for the Summer Residency is Midnight Mountain Time on Saturday April 5, 2014. Applicants will be notified no later than April 26, 2014. APPLICATION GUIDELINES: You must submit your application through the CAFE website:https://www.callforentry.org/ Applications without work samples will not be considered (3 images for Visual Artists, 1 -2 videos for Musicians, 5 page writing sample for Writers. ONE-MONTH RESIDENCY APPLICATION FEE AND DISCOUNT: The application fee for a one-month residency is $36.00. Artists who are re-applying for one-month qualify for a $12 discount using our Coupon Codes. Only one discount will apply. Photo workshop on art & object documentation: learn how to self-document your practice. If you are currently building your own catalogue or portfolio, preparing an exhibition or have just completed a new series of work, then this workshop will allow you to make a photographic record of your own practice while giving you the skills to continue doing so in the future. In few words, the workshop has been prepared as a way for artists to learn how to self-document their own practice. Early bird fee until Sunday 13 April 24.00hrs. Puro Delirio is a photo-studio based in London specialized in object and art work documentation. We are passionate about creating images that bring artworks to life. It's an integral part of the artwork and therefore should express the author's vision from a technical and creative standpoint. Our workshops happen twice a season, our documentation services are always available. 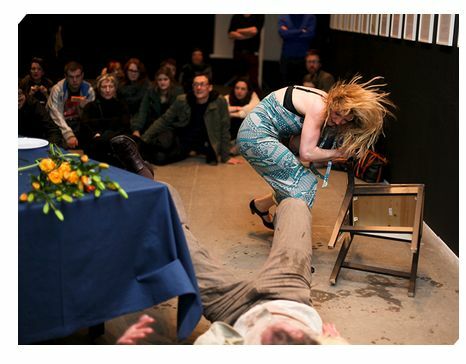 IBT and Arnolfini seek to commission an artist to make a new work to premiere at IBT15. We are looking for artists working across live practice, who challenge the boundaries of contemporary performance and question their relationship to audience, time and place. WILD CARD is committed to supporting artists who engage with live practice and employ an experimental approach to process, form and audience. We are looking for artists working in emergent artforms, artists perceived to occupy the margins of society, and artists redefining the qualities of engagement with audiences, participants, co-conspirators, and the wider public. Proposals across contemporary live art practice including: staged, durational, one to one, sited, digital, sound, visual arts and theatre. Artists with at least 3 years professional practice. An innovative idea for a new work for IBT15 (12-15 February 2015). Work that is realisable within the £2000 budget, and adaptable to different locations. Work which actively considers its relationship with an audience. 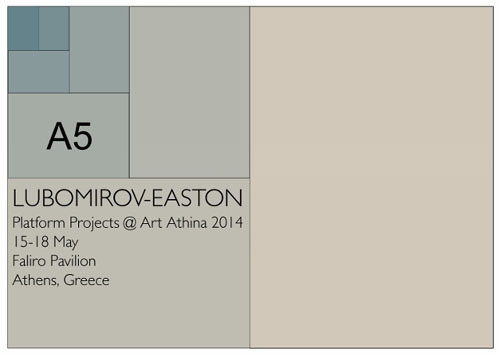 For this year’s Platform Projects @ Art Athina, LUBOMIROV-EASTON has invited a large number of international artists to send a letter to Greece. The only restriction on artwork is that it must fit inside an A5 envelope – a size which represents a single fold in the standard A4 letter size. The participating artists have complete freedom to interpret the 148x210 mm envelope space and there are no restrictions made on contents: whether the work is a postcard, a letter, or poster; whether painting, drawing, or sculpture; any object is allowed, including digital media such as a CD, DVD, or memory stick, or anything else that can be mailed and survive the postal journey there and back. There are no thematic restrictions either, and the resulting collection is intended as a broad snapshot of practices and ideas. It is then the role of the curator and the viewer to search out signs of a common language, which may perhaps exist, or be perceived to exist. The artists are, however, invited to consider the wider implications of the A5 format, such as for example its geometric properties, its history, its ubiquitous circulation. The A0 to A10 series of paper sizes have been used as an international standard throughout Europe and most of the world for nearly a hundred years. They were invented by a German scientist in the 18th century and first used officially in France during the Revolution. Their especial genius is the simple and elegant concept of creating a rectangle which preserves its width-to-length ratio when folded in half. For this to work, it can be shown that the sides of consecutive A sizes must be reduced by roughly 29% ( a scale factor of 1/√2 ). The largest size in the series, A0, has an area of 1m^2, and this basic unit of scientific measure is folded in half up to 10 times to create all the other sizes. Because every fold doubles the number of sheets, a single square meter can accommodate up to 32 A5 sheets. Hence the standard walls in Platform Projects give LUBOMIROV-EASTON ample scope to represent a significant range of artists at the fair. Visit www.ipcny.org/apply to apply online now! Please apply early to avoid technical problems due to volume. Applications received after the deadline will not be accepted. The deadline is 11:59PM, April 8, 2014. In keeping with our mission to promote the greater appreciation and understanding of the fine art print, IPCNY presents a selection of new prints several times per year. New Prints 2014/Summerwill be the 48th New Prints Exhibition. The Selections Committee will be announced in the coming weeks. Only original fine art (limited edition and unique) prints are eligible; reproductions of other artwork such as drawings or paintings are not acceptable. Selections will represent a broad diversity of sources, geographical and otherwise. Prints must have been completed within a year of the submission deadline. THERE IS NO ENTRY FEE. Independent artists, workshops, publishers and dealers are all welcome to submit recently completed print projects. Please refer to the Submission Guidelines below. 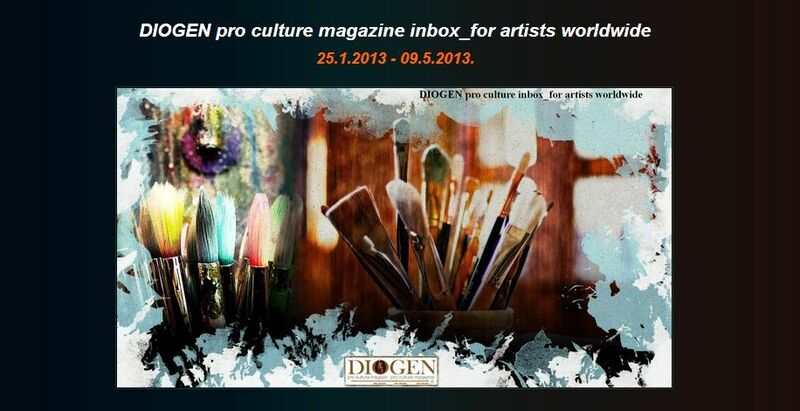 All artists whose work has been selected will be notified by email. 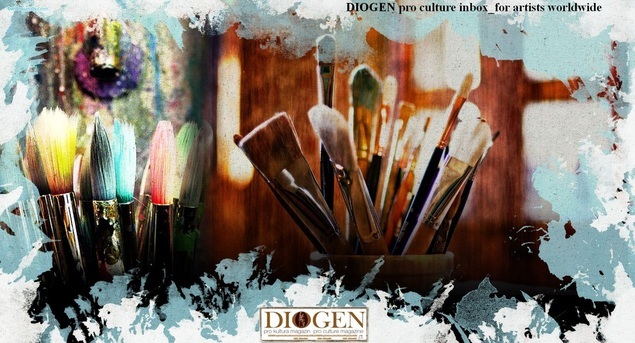 If you have not received word by mid-May, please check our website homepage for a list of artists. Please do not call. *IMPORTANT NOTE: This show will also be presented at Christie's showrooms in midtown Manhattan as part of an IPCNY New Prints exhibition from 7/9/2014 - 7/16/2014. Please note that all work selected for New Prints 2014/Summer at IPCNY will be included in the exhibition at Christie's. Work will be returned to artists following the Christie's show. Artists and publishers whose work has been selected will be responsible for the framing and delivery of work to IPCNY by May 20, 2014. IPCNY will cover the return cost of delivery within reason (up to $100). If you would prefer to apply by MAIL, please see submission guidelines below for instructions. Mail to: IPCNY, New Prints Program, 508 West 26th Street, 5th Floor, New York, NY 10001. DO NOT SEND ORIGINAL ARTWORK, ENCLOSE BINDERS, FOLDERS, OR ANY MATERIALS OTHER THAN CD AND IMAGE LIST. A maximum of five works per artist is allowed, with one image and one optional detail per work.There is no size limit. No phone calls. Images must be clear, professionally presented, and accurately represent the work. Images must be in jpeg format, the largest dimension (length or width) at 800 pixels. Image resolution at 72 dpi. The list must be headed with the name of the submitter and complete contact information: address, phone number and email address. Publishers, please include a new form for each artist submitted. Each list entry should be numbered corresponding to the number on the digital images. The list should include: Entry number, artist's name (first, last), title, date completed, medium, edition size, dimensions: (Height x Length in inches) plate size, paper size, printer, publisher. Paducah Photo is now accepting entries for the 2014 competition and exhibition. Please click here to enter your photography. We are very pleased to announce that Mary Ann Redding, Photography Department Chair at the Santa Fe University of Art & Design will be the juror for this year's exhibition! Mary Ann has been the Chair of the Photography Department since January 2012. For the previous five years she was the Curator of Photography at the New Mexico History Museum/Palace of the Governors, where she curated two major exhibitions: Contemplative Landscape and Through the Lens: Creating Santa Fe. Recent exhibitions include: In/Visible Borders: 19 New Mexico Photographers at the Marion Center for Photographic Arts and the Santa Fe Community Gallery; David Taylor: Working the Line at the New Mexico History Museum; A Passionate Light: The SX-70 Polaroids of H. J. Waldrum at the Albuquerque Museum of Art; and Separating Species & Grasslands at 516 ARTS, Albuquerque. Previous professional positions include: Director and Curator at the New Mexico State University Art Gallery, and, Executive Director and Curator of the Light Factory in Charlotte, NC. Redding has published numerous essays on photography and contemporary art. Recent publications include Gila: Radical Visions/The Enduring Silence, Photographs by Michael P. Berman; Light in the Desert: Photographs by Tony O'Brien and Through the Lens: Creating Santa Fe; all published by The Museum of New Mexico Press; and Grasslands/Separating Species published by Radius Books in conjunction with the exhibition at 516 ARTS in Albuquerque. Yeiser Art Center's mission of developing the appreciation of the visual arts and nurturing the creative spirit played an important role in Paducah's designation as the world's seventh City of Crafts and Folk Art by the United Nations Educational, Scientific and Cultural Organization (UNESCO). Membership in the UNESCO Creative Cities Network cultivated this exciting new opportunity with Santa Fe, New Mexico, also appointed UNESCO City of Design, Crafts and Folk Art. Yeiser Art Center looks forward to the partnership with Mary Anne Redding and the Santa Fe University of Art & Design Photography Department. The potential to optimize reach and grow the Paducah Photo exhibition is thrilling! Originating in 1975, Paducah Photo has grown from a fledgling contest to the Mid-South's most prestigious annual photographic event. Based in Western Kentucky, Paducah Photo is open to all photographers working in digital or film photography, including color and black and white photography, photographic book arts and photographic alternative processes. All work submitted must be original, completed in the last three years, and not previously exhibited in a Paducah Photo exhibition. $2,500 will be awarded to selected artists. To be eligible for the 2014 Regional Showcase, photographers must enter Paducah Photo 2014. These works will be exhibited at Maiden Alley Cinema in tandem with the Paducah Photo 2014 exhibition. All international entries not selected for Paducah Photo 2014 will automatically be considered for the Regional Showcase. Who: Beep Wales International Painting Prize is seeking artists who work in traditional format or testing new media in relation to painting. The exhibition will be spread over two venues in Swansea's city centre. When: 10th October - 9th November 2014. Locations: Elysium Gallery, 16 College Street, Swansea, Wales & another surprise venue TBA. Awards: The Judges main prize (£800) winner to be announced on the evening of the opening and the people’s prize (£200) will be announced at the end of the exhibition. Fees: £15 submission fee made payable via PAYPAL at www.beepwales.co.uk or by cheque made payable to ELYSIUM GALLERY, posted to Elysium Gallery, 16 College Street, Swansea, Wales, SA1 5BH. Deadline for submissions: 15th August 2014. 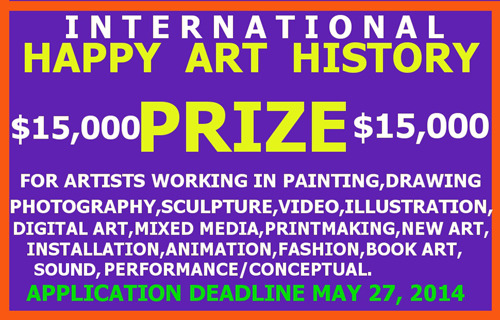 Happy Art History Prize International Semiannual Call for Artists. 3 prizes $ 5,000 each, 20 runners ups Honorable Mention and image inclusion with contact info on Prizes Page. Artists from anywhere in the World working in Painting, Drawing, Sculpture, Installation, Illustration, Video, Sound, Photography, Mixed Media, Computer Art, Printmaking, Performance-Conceptual, Animation, Fashion, New/Experimental media, Book Making can apply. Students can apply. Starting Artists, Mid Career and Veterans can apply. All Styles are Welcome. Early Submissions are Encouraged. Results announced and Prizes paid on June 9, 2014. Deadline for submission: May 1, 2014. Submission fee: $25 by April 1 and $35 by May 1. The Summer Show Project offers the unique chance for artists to work directly with FOLEYgallery. The exhibition will feature one artist that works with photography and one artist that makes works on paper. This initiative will provide an opportunity for emerging or under represented artists to have their work seen, recognized and reviewed in a professional gallery setting. Upon acceptance, you will work on your own and with the guidance of gallery owner Michael Foley to create a well curated two person exhibition. This is the fifth year for The Summer Show Project. We invite you to submit your work to participate in this unique opportunity and share the experience of exposure, guidance, feedback, community, recognition and support. We invite artists from all disciplines to apply who work in photography and works on paper. The Summer Show Project is open to all artists world wide. 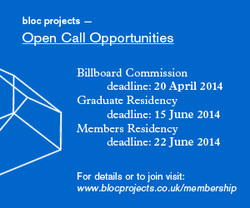 Bloc Projects is pleased to invite proposals for its two publicly situated billboards. Positioned close to the Bloc Projects gallery space in the centre of Sheffield, UK, the billboards have shown work by a range of early-mid career artists since 2004. Proposals must be for two dimensional works either printed as a billboard or applied directly to the boards, and may include examples of the proposed image or a description of a new work you intend to produce. Applications are welcome from visual artists working in any discipline, including those who may not usually work in two dimensions. Applicants must be members of Bloc Projects – find out more about the full range of member benefits and how to athttp://www.blocprojects.co.uk/membership/. Successful applicants will be paid a fee of £150, and the selected works will be on display for one month in Summer and Autumn 2014. Bloc Projects will cover all material and printing costs. The billboards measure 500 x 175 cm approx’; full measurements and print specifications will be provided to the successful applicants. Please note: We can not accept proposals for three dimensional works or proposals sent by post. All artists included in the project receive a free copy of the hardcover book. INPHA is open to a very broad range of lens-based and photographic submissions. This project is not just for 'photographers' and 'photography' but also for anyone working creatively in a visual art (or design) field with work that incorporates the lens or photographic process in some significant way, including manipulated processes. As with all Manifest projects, we are open to learning and sharing what's being done that fits within this broad scope. The competition and publication is open to any artist submitting original works of art or design created within the timeframe of 2011 - 2014. Professionals and students in ALL disciplines are encouraged to submit. For this call for submissions Manifest is eager to receive works in a wide range of types, including traditional, digital, and experimental photography, video*, and other lens-based work. As with its other annual publications, Manifest is open to unexpected solutions, broad interpretation, and surprise. Works submitted must clearly feature the photographic or lens-based process as a primary, but not exclusive, characteristic. *note that artists submitting time-based art (video, etc.) must realize that for the purpose of the publication only still imagery will be used to represent the project in print. The Jonathan Vickers Fine Art Award is one of the most prestigious, nationally recognised and coveted Art Awards in the UK. The Award is open to emerging painters from across the UK with the successful artist receiving a nine month residency, a bursary of £18,000, a studio, a contribution to the cost of materials and on-going support and mentoring from the University of Derby’s Faculty of Arts, Design and Technology. The theme of the sixth Award is ‘Sense of Place’, inspired by the people, landscape and heritage of Derbyshire with a focus on ‘Our Treasure Houses’. During the nine months residency the artist will focus on producing new work for public exhibition in Derby Museum and Art Gallery and other spaces across Derbyshire. The artist will also contribute 5 days of teaching in the University’s Arts, Design &Technology Faculty and Fine Art department and facilitate a programme of educational workshops in the community. This is an exciting opportunity for an artist who is ready for the challenge of responding imaginatively and creatively to the residency brief. We are looking for a talented, organised, self-motivated artist who will be able to communicate effectively and confidently with the local community, act as an ambassador for the Award and the University and who has the maturity and personal skills to work with people on all levels. The nine month residency runs from 1 October 2014 to 30 June 2015. The final exhibition will be held at Derby Museum and Art Gallery from 19 September 2015 to 17 January 2016. The artist will be required to be available for the launch of the exhibition and there will be an expectation that they will also be available for a number of events during this period. Closing date for applications: 31 March 2014. Interviews will be held in Derby on Monday 19 May 2014. Cost of application: £25 (for submission of up to 6 paintings). 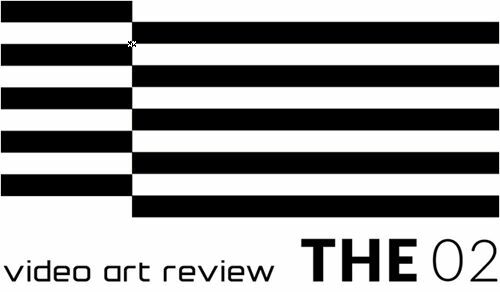 WHO: Open to all UK artists who work in drawing either in traditional formats or testing new media in relation to drawing. WHAT: Elysium Gallery is seeking work for two exhibitions as a part of our cultural exchange with the Clara Hatton Gallery at Colorado State University, USA and will form a part of Wales's Dylan Thomas 100 celebrations. All 2-D work must be unframed and no bigger than A2. DETAILS: There will be a catalogue published featuring selected artists which will be available for the Nov/Dec Elysium gallery exhibition. The exhibition will also be a focal point to a number of drawing based events, exhibitions and activities which will take place in various offsite locations near elysium gallery. DESCRIPTION: The Rymer Gallery is excited to announce our Second Annual Directors Choice Juried Exhibition "FIGURATIVELY SPEAKING: Contemporary Art and The Human Body"
All works will be anonymously reviewed and selected for exhibition by Rymer Gallery Director, Natalie Dunham. ELIGIBILITY: Open to all US and International artists at least 25 years of age. - 2-D artwork should not exceed 4' x 4' x 1' in dimension and should not exceed 50 lbs in weight. 3-D artwork should not exceed 5' x 2' x 2' in dimension and should not exceed 60 lbs in weight. Notice: shipped artwork will be sent out as soon as possible (arranged by the artist and gallery), and must include a shipping return label. Located on Fifth Avenue, The Rymer Gallery is one of the largest contemporary galleries in the heart of Nashville’s arts district. The objective of the gallery is to continue the legacy endowed by The Betty Rymer Gallery at The School of the Art Institute of Chicago, by supporting the best of what the contemporary art world has to offer. In addition to the cutting-edge 3,000 square foot location, there is an annex gallery and artist studio located one block away, next to the Hermitage Hotel, Tennessee’s only 5-star hotel. The Hermitage Hotel has endorsed our gallery and has actively cooperated with us in reaching their prospective patrons. The spectrum of artists we represent ranges from emerging to established in all media. The ways in which we promote, exhibit, and sell our artists is just as diverse. Locally, we host monthly exhibits of our exclusive group of artists for the downtown Nashville Art Crawl, the first Saturday of every month. Nationally, we propose our artists’ work to major museum collections through producing catalogues and submitting custom-curated shows that cater to museums’ needs. Internationally, we will be offering our artists’ work through participating in choice contemporary art fairs. Our goal is to foster artwork that entices, engages, and lures artists, collectors, and enthusiasts to Nashville’s expanding art scene. In addition, we're also opening a call to international artists to apply for the Impakt Works residency programme in Utrecht. We encourage projects connected to the Soft Machines theme. These residencies will take place between April and October. Read more on thesubmission guidelines here. Deadline for proposals: 1 April 2014. - press and public communications. The position is for 3 years with possible renewal for another 2 years. Compensation is paid on a fee basis. Curwen Gallery are looking to represent an exceptional figurative painter. The prize is open to UK based artists at any stage in their career and held at Curwen Gallery in central London. The selectors will be paying particular attention to technical skill and are looking for artworks which illustrate exceptional ability in the field of figurative painting. Selection will be made by a panel of judges including Sir Peter Blake (artist), Nicholas Usherwood (editor, Galleries Magazine), Anthony Green RA (artist) and Jill Hutchings (Director, Curwen Gallery). The first prize is £1000 prize money and the opportunity for a solo exhibition with Curwen Gallery in 2015. There will also be a purchase prize presented by Odgers Berndtson. There is a charge made to each artist of £15 to enter three paintings in the competition. See www.curwengallery.co.uk/prize for application forms and terms and conditions. Project-based scholarships enable artists with specific projects and concerns to join the Transart MFA. The Transart Earth Awareness Prize awards a quarter of tuition costs on the MFA Creative Practice to two artists with MFA projects that raise environmental awareness and are exemplary in dealing with the many challenges we face in advancing stewardship for the earth. The Transart Social Change Award gives a quarter of tuition costs to two artists whose MFA projects champion social change through direct involvement with communities or through raising awareness for a specific issue. 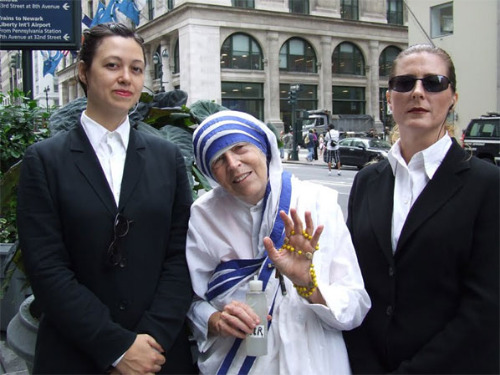 The Transart Peace and Mediation Prize awards the same amounts (2x$10,000) to two artists with MFA projects that deal with the role of art in peace and mediation. Furthermore, two Transart Merit Awards will be given to applicants whose practice and proposed projects are of the highest level of artistic achievement. These awards are not limited to any media, theme or specific field. The amounts awarded are the same as on the other prizes. Artists who wish to be considered for any of the awards need to apply to the MFA Creative Practice by April 15th. Award winners in each category are chosen by an independent jury no later than May 5th. This program provides one deserving curator the necessary time and resources to realize an innovative project, with the aim of encouraging curatorial research in tandem with exhibition planning. CUE will provide institutional guidance to the curator, who will produce a group exhibition in CUE’s space with related public programming and an accompanying exhibition catalogue in July 2015. Curator will be awarded a $1,000 unrestricted stipend and an exhibition budget of $4,000. For more information and the full list of submission requirements, visitcueartfoundation.org/curatorial-open-call. For a list of Frequently Asked Questions, please visit cueartfoundation.org/curatorial-faq. For questions regarding the application requirements, please contact Jessica Gildea, Associate Director of Programs: jessica@cueartfoundation.org. Thematic: #stacktivism is a term that attempts to give form to a critical conversation and line of enquiry around infrastructures and the relationship we have to them. #stacktivism has recently attracted a great deal of debate and interest and is an ongoing, and increasingly popular subject of interrogation for theorists, economists and creative practitioners alike. As the digital divide and post‐internet discourses lose traction and diversify, artists and creative technologists are faced with a new set of trending critical dialogues in the face of the morphing technological landscape. The INFRA_SPECTION residency acknowledges this shift, and the participating artists are invited to enter into a dialogue with the rapidly evolving perspectives of #stacktivism as a catalyst for their practice. Please include a diversity monitoring form with your application which can be downloaded here. More about #stacktivism here and here. All entries for the 2014 Fantastic Fibers exhibition will be processed on our website:http://fantasticfibers.theyeiser.org. The SIGGRAPH 2014 Art Gallery will gather and present outstanding, critical, and innovative artworks and projects submitted by digital-minded artists. While the essential aim is to provide a deeper insight into the relationships within art, science, technology, research, and societal developments, the Art Gallery also encourages strong content and criticality in submitted works, conveyed through the use of advanced technologies. This year’s jury includes Basak Senova (curator and designer; the Art Gallery Chair 2014; lecturer at Department of Media and Visual Arts at Koç University), Mona Kasra (artist and educator; the Conference Chair 2016; digital media scholar at University of Texas), Amit Zoran (HCI and craft researcher; the Art Gallery Chair 2015; Post-Doc at the Fluid Interfaces Group, MIT Media Lab), Kate Armstrong (curator, artist and writer; Director of the Social + Interactive Media Centre at Emily Carr University of Art + Design), Cezanne Charles (artist, designer and policy-wonk; Co-Director of rootoftwo - hybrid design studio, Director of Creative Industries at ArtServe Michigan), and Mushon Zer-Aviv (designer, educator and media activist, faculty member at Shenkar College of Engineering, Design and Art). The theme of the SIGGRAPH 2014 Art Gallery is "Acting in Translation." Translation indicates a detached and forward movement from the source. It is also a freeing act, which paradoxically contains a burden of responsibility for the source. Therefore, this movement has limits and fine borderlines, yet it could designate "more" than the source. Translation is a call for other realities and also another way to see other realities. Translation can also blend "fact" with fiction by blurring the difference between them. In this vein, "translation" as a term could be interpreted in multiple ways on different layers of perception. While this term indicates a mechanical act, it may also refer to global and local societal developments such as resistance movements, alternative economies, information leaks, migration flows, mobility, etc. 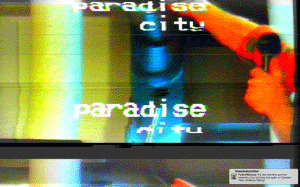 2D and 3D artworks, interactive, electronically mediated Augmented Reality (AR), mixed-media installations and performances, web-based art, responsive media, time-based works, works leveraging mobile technologies, works using digital communities and social media, robotics, touch-screens, wearable art, mediated music, sound and audio artworks are all accepted. Artists are encouraged to give an Artist’s Talk and/or host a Course and Course Lite if their work is accepted. Please indicate your interest on the Art Gallery submission form. Submitters are also encouraged to submit proposals for Talks or Art Papers that address themes related to works presented in the gallery. A special issue of Leonardo, The Journal of the International Society of the Arts, Sciences and Technology includes visual documentation of the works exhibited in the Art Gallery. Publication of this sixth special issue coincides with SIGGRAPH 2014. Special Interest Group on Graphics and Interactive Techniques (SIGGRAPH) is an annual conference which provides a unique crossroads for a diverse community of researchers, developers, creators, educators, and practitioners. SIGGRAPH's mission is to be the premier annual conference on leading-edge theory and practice of computer graphics and interactive techniques, inspiring progress through education, excellence, and interaction. The program was inaugurated in August 2013 and awards each fellowship for one academic year. The second fellowship is to start in August 2014. Haus der Kunst is a non-collecting public museum and a key global center for contemporary art located in Munich, Germany. It is dedicated to the exploration of the diverse histories of contemporary art based on a foundation of focused exhibitions, research, and education. The museum's aim is to further establish research as an integral cornerstone of its vision, and to develop a context for scholarship that allows for the interplay of art, culture, politics, and society in the way modern and contemporary art are understood on a global level. The "Goethe-Institut Fellowship" is an important building block towards this aim. The fellowship shall concentrate on the research for a comprehensive exhibition project on the global art historical developments of the Post-war era. The Post-war project is substantially supported by the German Federal Cultural Foundation, and is the first of a trilogy whose second and third chapters will be devoted to the periods of Post-colonialism and Post-communism. One of the main tasks is the research and organisation of a series of seminars and colloquia in preparation for the project. - Demonstrated accomplishments in the field of research, education and/or exhibition practice at a research institute, university or art college. - An overall remuneration package of 25.000 Euro for the entire year. This includes any health care and tax payments. - Accommodation is the responsibility of the successful candidate. Interested scholars are invited to send their application via email to Isabella Kredler underkredler@hausderkunst.de. The application should be in English and include a curriculum vitae, bibliography, reference letters and a cover letter explaining the motivation for the application. The application deadline is January 15, 2014. For more information on Haus der Kunst, please visit www.hausderkunst.de/. Edith-Russ-Haus for Media Art will award three production and residency grants—10,000 EUR each—to promote international artistic efforts in the field of media art. The grants from the Foundation of Lower Saxony at the Edith-Russ-Haus for Media Art were created in 2001, and are recognized internationally for their support of the production in the wide range of media art, from video art and net-based projects to audio or audio-visual installations. The grant covers a period of six months—July–December 2014—and requires residence in Oldenburg for at least one month. The project or artistic work should be completed within the six-month grant period. An international jury of experts will choose the grant winners. The Edith-Russ-Haus for Media Art will award up to five grants for artistic works in the area of new media. –up to three artists will be acknowledged by having their work presented in the Award for Emerging Artists exhibition at the ERH. The Edith-Russ-Haus for Media Art would like to recognize new stances in media art and support the winning artists with grants and/or an exhibition. The prize is intended to lastingly promote the careers of young media artists. Awards will be given to existing works from the broad spectrum of media art, from net-based projects or video art to audio or audio-visual installations. 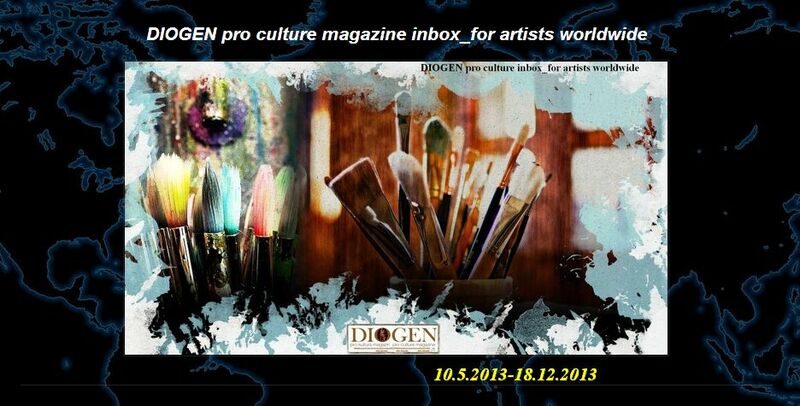 International artists up to the age of 35 may participate. An international jury of experts will choose the prize winners. The Edith-Russ-Haus for Media Art opened in 2000 and is devoted to a wide range of current issues related to media art. Exhibitions by international artists and presentations, performances, concerts, workshops and lectures by media artists and theorists are regularly organized. Important past exhibitions have dealt with key contemporary themes such as Something Other Than Photography: Photo&Media andGeneration i.2 – The Aesthetics of the Digital in the 21st Century; important media artists have been presented in solo exhibitions. In October 2013, the first exhibition of the winners of the Edith-Russ-Haus Award for Emerging Media Artists of the Sparda-Bank was presented: Kuai Shen with the space and sound installation Oh!m1gas: biomimetic stridulation environment and ss-io (Hyun Ju Song und Mi Lyoung Bae) with the generative audiovisual installation The Moment. Since 2001, the Edith-Russ-Haus for Media Art has conducted a regular guest-artist programme, which up to now has sponsored and implemented 35 artistic proposals. To this end, two one-room apartments and a residential studio are available in the guesthouse of the Edith-Russ-Haus, and grant recipients can call upon the institutional support of the institution in implementing their projects. Submission fee: none to edit. FUNDACION´ACE is now accepting applications to the Artist-in-Residence International Program 2014. We are looking for all kind of visual and multimedia artists and curators who want to submit proposals to be in residence and to take advantage of the intense cultural life offered by Buenos Aires, one of Latin America cultural centers. Proyecto´acePIRAR Artist-in-Residence International Program aims to support all kind of contemporary artistic practices (including performance and curatorial proposals) through research and production residencies, promoting the exchange, debate, experimentation and collaborative work. The program accept all kind of multidisciplinary contemporary artistic practices with a special interest in expanded field proposals that involve traditional and innovative print media practice and its hybridization with other disciplines( such as photography, design, writing, urban interventions and new media) exploring their mirror influences, as well as the capacity of multiple. Its vision is to be a nurturing place for creativity, one-of-a-kind residency in South America that achieves successfully bringing together artists around the world, bridging the gap between old and new technologies and artistic genres. Qualified candidates from all countries and nationalities are encouraged to apply; ´ace team is bilingual Spanish/English. 2) Read carefully these documents, understanding the costs involved and what the residency fee does and does not include, all described in the guidelines. You can also have additional information at FAQ in the web page home. Filled application form with the required information:Letter of intention- Personal Resume or CV.- 10 images of recent work. Applicants may upload images (jpg) with a resolution of 72 ppi and a largest dimension around 800 px. Applicants will receive confirmation about if the proposal is accepted by mail during March 2014. In partnership with Brighton Festival, Lighthouse and University of Brighton, Photoworks and The Regency Town House. HOUSE is Brighton & Hove’s annual visual arts event concerned with the commissioning of new work in partnership with Brighton Festival. HOUSE utilises domestic and unusual spaces to situate work throughout the city. HOUSE 2014 invites outline proposals from artists based in the South East region, including London, for a series of commissions to be realised in May 2014.
the open west is an annual open competition and exhibition inviting work from national and international artists practising contemporary and conceptual art. Work submitted can include painting, installation, film and sound, textile, photography, ceramics, print, drawing, performance, sculpture, glass, metal and plastics. 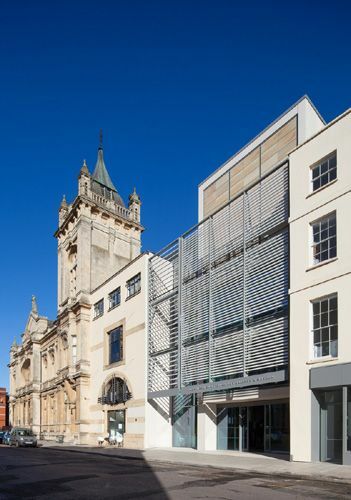 Following the success of the 2013 programme, the open west 2014 will be held in the main galleries and permanent collections of The Wilson, the newly opened contemporary museum and art gallery in Cheltenham. Up to 40 artists will be included in the exhibition, each with the possibility of showing more than one work. the open west 2014 will offer an opportunity for artists to participate in an education programme; residencies; workshops and a day of artists in conversation. A catalogue is published each year. Anita is Dean of Bath School of Art & Design (Bath Spa University) and founding director of the Jerwood Drawing Prize. She is a figurative painter and, alongside her practice as an artist, has worked in art education in numerous roles, including: Director of the National Art School in Sydney, Australia; Director of The Centre for Drawing at the University of the Arts, London; Dean of Wimbledon College of Art, University of the Arts, London; and Deputy Head of School, School of Art, Media and Design at the University of Gloucestershire, where she was first awarded a Professorial title. Virgile is an artist recently graduated from the Royal College of Art who works with installation through sculpture and photography. 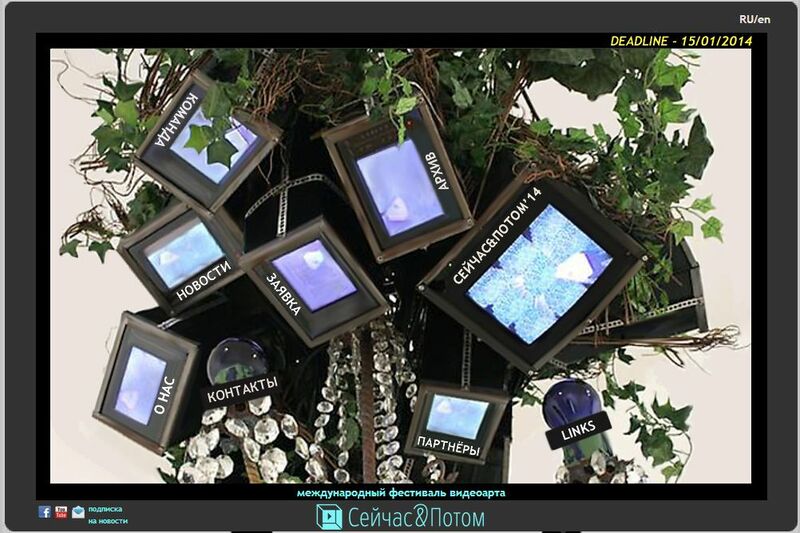 The competition is being held within the framework of the International Video Art Review THE 02. 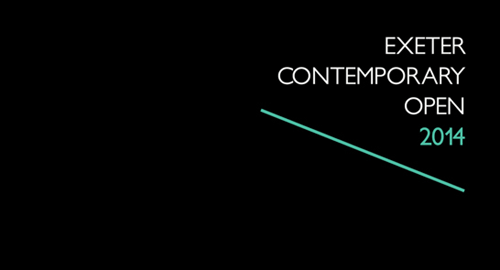 5 – 6 April 2014, premiere screening in the Museum of Contemporary Art in Krakow (MOCAK), Poland. May 2014, broadcast on TVP Kultura (Polish public television channel about culture and art). Screenings in galleries and museums in 22 cities in Poland, including Gdansk, Wroclaw, Warszawa, Torun, and Poznan. Promotion of the winner of the competition on the organiser’s website. Special show of video works by Roger Ballen, Patrick Jolley, Kasumi, Konrad Kuzyszyn, Fabio Scacchioli, Łukasz Surowiec, Salla Tykkä and Li Xiaofei. Deadline 1 March 2014. No submission fee. The program is intended to give Fellows the time and space they need to realise their specific objectives and projects, within a vibrant cross disciplinary intellectual context. 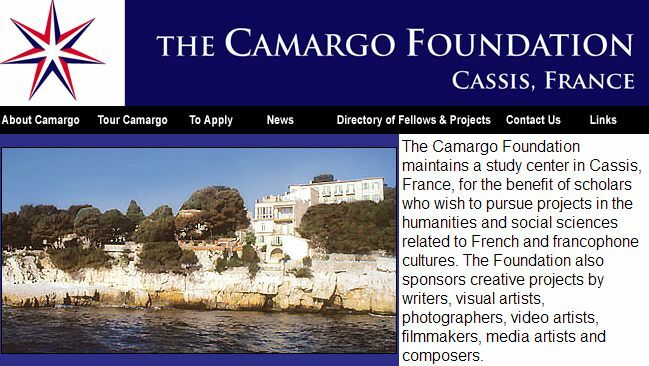 The Foundation's beautiful hillside campus overlooks the Mediterranean Sea in Cassis, France; it includes a reference library, outdoor theatre and art/music studios. Fellows are provided with accommodations on campus in fully furnished apartments with private kitchens. Partners are welcome. A stipend of $1,500 is available. Fall Fellowships are 8 weeks in duration from October 1st to November 26th 2014. Spring Fellowships are for 4, 8 or 11 weeks duration from January 28th 2015. Qualified candidates from all countries and nationalities are encouraged to apply; proficiency in English is a requirement. The application deadline is January 13, 2014. Video artists from all over the world are invited to submit their works for the forth edition of International Video Art Festival 'Now&After'. International Video Art Festival 'Now&After' is an annual event held in Moscow, Russia, and traditionally hosted by a museum. During several weeks 'Now&After' festival program is being demonstrated as a unique integrated video installation that includes all participants' works. Apart from general demonstration, one video of the program is being presented every day, and during that day it is being demonstrated on the designated screen as video installation called 'Video Now'. The authors of the best films will be awarded. The Festival's Prize Fund is 3,000 $. Videos should have a screening quality (720px X 576px). KARST is announcing an international open call to curators, collaborators and artists to submit proposals for exhibition during 2014. We are particularly interested in projects that seek to exhibit challenging and experimental work, engaging with new ideas through critical dialogue and experimentation in contemporary arts practice. Proposals for new works, existing works or touring shows including, events, exchange projects and all multidisciplinary practices will be considered. Selected proposals will be provided with funding towards an exhibition production budget, in addition to installation and administrative support. 2) Artist Statements / Biographical info of participating artists / curators. 3) Exhibition Proposal. 600 words max, plus a realistic considered timescale of delivery and estimated production budget. > Early submissions of proposals are advised so additional information for shortlisted proposals can be requested if required. > Applicants will receive a receipt e-mail confirmation upon submission. 360 XOCHI QUETZAL is a FREE artist and writer's residency located in Chapala, Mexico. Writers, visual artists, photographers, musicians and new media makers are welcome to apply. Summer residency applications will be available in a few weeks (June, July, August). APPLICATIONS ARE DUE JANUARY 18, 2014 through CAFÉ http://www.callforentry.org/ for the May 2014 residency. Applications are now being welcomed for the second Jon Schueler Scholarship, Visual Artist in Residence, an exciting international residency opportunity to take place in Skye in the summer/autumn of 2014. In a unique international partnership between Sabhal Mòr Ostaig, the National Centre for Gaelic Language, Culture and the Arts (Scotland) and the Jon Schueler Charitable Trust, the successful applicant will have the opportunity to come and research, develop and produce work for 3 months in the dedicated artist's studio in a spectacular setting overlooking The Sound of Sleat, the place which so inspired Schueler as an artist. The Scholarship is open to international artists (including Scottish and UK) working to the highest level of contemporary professional practice in a visual medium and with a particular interest in landscape and the environment. The annual (2013 -2016) visual arts scholarship has been set up in celebration and in memory of the life, work and artistic influence of internationally renowned artist and abstract expressionist, Jon Schueler (1916-1992), in recognition of his very special relationship with the landscape and environment of the Sound of Sleat. The aims of the residency are 1. to provide a visual artist working to the highest level of contemporary practice a period of research, development and production in a unique environment 2. to promote Skye, The Gaeltachd and Scotland as an exciting, distinct and inspiring place to work for a contemporary artist, and to promote the exchange of ideas. The residency is for 12 weeks 4th Aug - 24th Oct 2014. 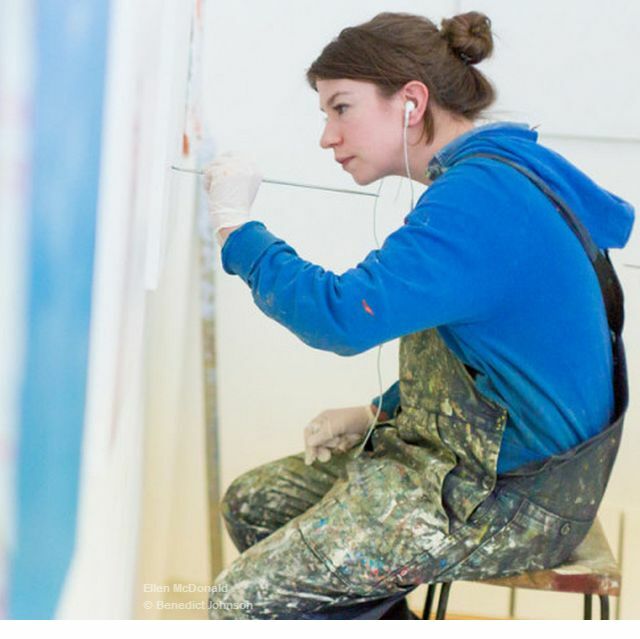 The Scholarship will enable a visual artist to come and work in and from the large Visual Arts Studio, based within the FÀS Centre for the Creative and Cultural Industries, Sabhal Mòr Ostaig, in a rich and multi-disciplinary arts environment. The Stiùidio Ealain is a custom-built working Visual Artist studio. Perched high over the rocky shoreline and looking out over the Sound of Sleat and Knoydart.